The day I left Champakali, I realised, that if ever I sat to tell her story, I’d always start with that one mud path. It was one of the brightest December afternoons; I had secured North Goa as a handsome backdrop and driven to the old part of town. Here, the romance of old church ruins had filled not just the air, but ‘time’, engulfing centuries at once, sometimes apparent in the heavy moss growth over the fallen bricks of St Augustine’s Church, sometimes invisible like in the large wooden gate I was about to cross. On the other side, a sole red gravelled lane took a blind turn and brought me deeper into an unnervingly quiet spot. And suddenly, I ceased to recognise the city I was in. 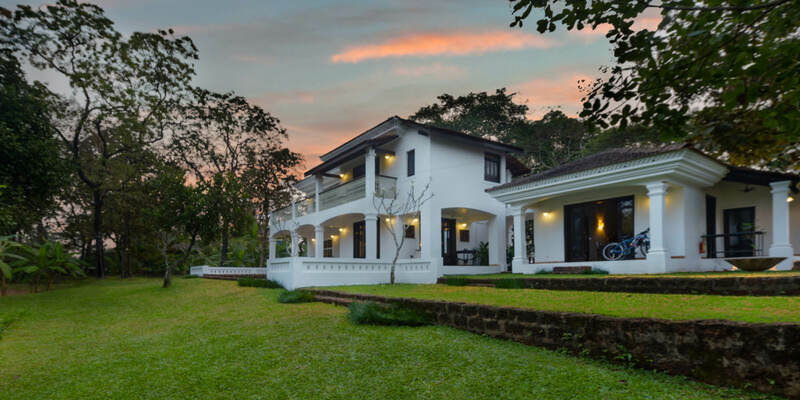 But Champakali knew how to evoke just enough mystery before dispelling her charm—she stood peeking from a corner at the end of the driveway where my car halted—a two-villa boutique property, brandishing her white sturdy silhouette against the sun. A lush layer of crab grass stretched from her feet to different quarters, till the palm and teak trees intervened and towered over the foliage. Inside, nature had put ample effort in its attendance; two villas, called Teak and Banyan had three bedrooms each, fondly named after birds: Mayna, Mor, Bullbull, Tota, Kauwa, and Kabootar; the tiniest bird curios planted themselves at different spots at centre and side tables; a pair of window knobs were replaced by large pink and purple droplet-shaped beads; freshly plucked champa flowers floated on brass plates; armchairs lazily overlooked the property from its well-defined corners. Each villa had its individual living room, kitchen and pantry on the ground floor, and a gazebo abutting its flip side. Invisible to the front porch, the backyard had a swimming pool with sunbeds enjoying a sun-kissed Goan afternoon. 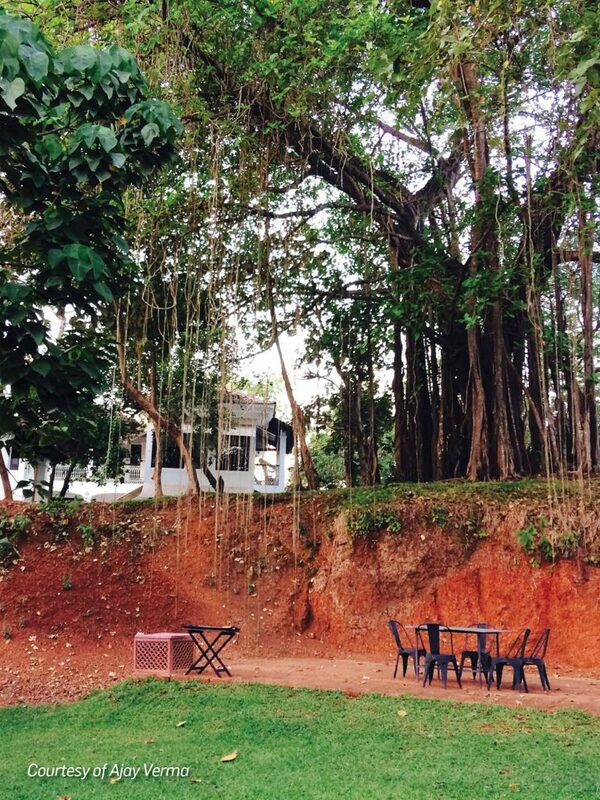 This family-run boutique gem is the brainchild of Delhi-based Bindu Sethi, an ex-advertising exec who came to this secluded piece of land (belonging to her and her husband) one season and fell in love with the magnificent banyan tree that unapologetically spread out as something much larger than itself. She had decided right then to build a home around it, just to do the tree some justice. Everything else had simply followed—a collection of small and large design pieces that she’d collected over the years from around the world—a basket from a Thai flea market, a little ornamental glass teapot from Syria, four empty photo frames from an old, antiques dealer in Jodhpur, and hand-painted lampshades from Srinagar. Every time she’d come to Goa, she’d secretly make an addition which kids Devika and Gokul would find by surprise on a leisurely walk around the house. 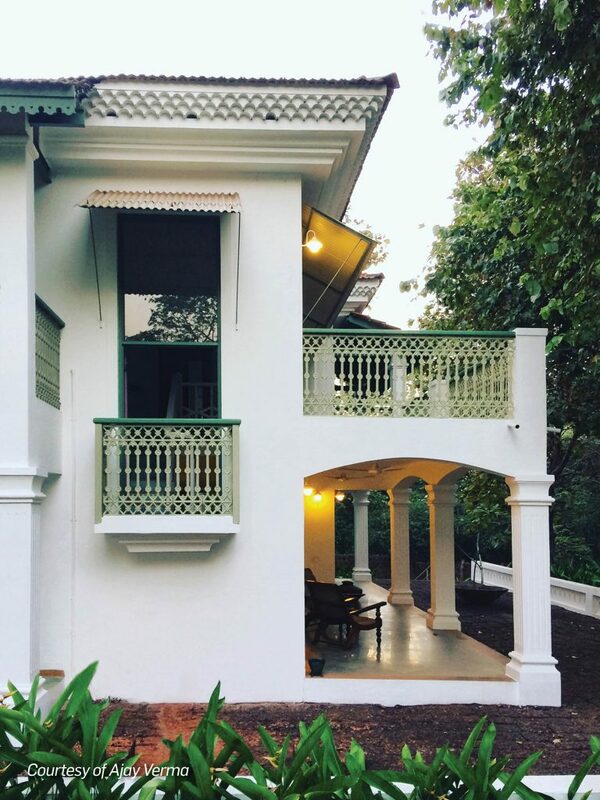 In the evening, I sat below my Kauka room in the living area, surrounded by the whispering of night bugs and a book on Goan history on my lap. 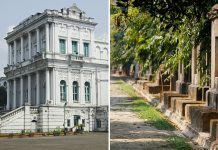 Without a tactic, I gradually lapsed into my childhood when I spent summers in my father’s colonial office bungalow in Calcutta. I had felt exactly the same—embalmed by the quilt of an unhurried night, when I’d take to a corner of a house and let my mind wander away aimlessly before dinner time. And then, a jazz number would come floating through the air to make the room and everything in it, timelessly carved in my memory. That night, Billy Holiday kept me company for a candlelit dinner in the Teak villa gazebo as I sang a jazz number with my taste buds. 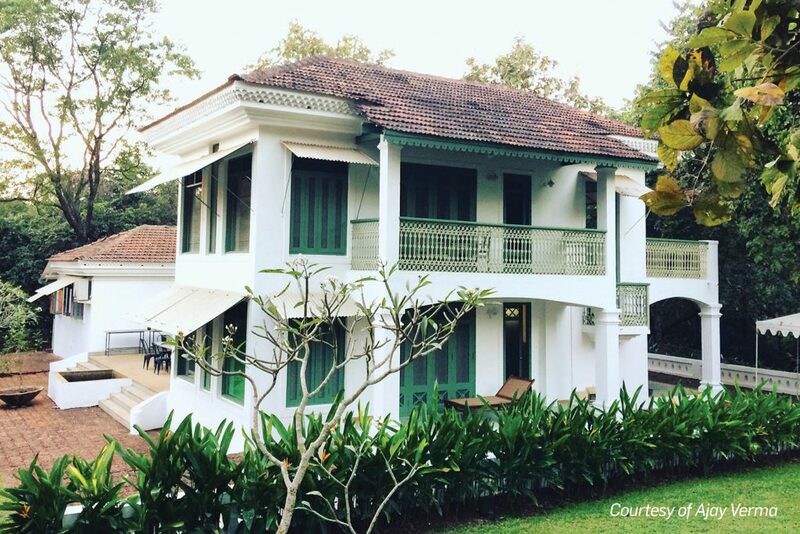 The architecture of Champakali reminds you of an old Goan house with green mouldings on the roof, red oxide flooring, wooden door frames, vaulted ceilings, and separate open and wet kitchens. And then, as a sharp contrast to the well-secured Goan house comes a profusion of ventilation—long window panels in bedrooms and living rooms opening to all four sides for cross breeze. I had blatantly cancelled my plans of venturing out the previous night to enjoy what I had at hand; the old-world charm of a three-month old Champakali and the delicious food that came from its kitchen. 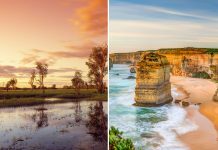 Locally sourced king fish, fresh bread from a local bakery, wafer thin crepes lathered in Nutella, and single origin estate coffee were some of the perks, but no customisation might come close to their selection of teas. The Champakali brews are curated by the family: the Earl Grey has bergamot and lavender, a special monsoon infusion has hints of vetiver and rose. I settled for the ‘Champakali Morning’ two times a day with a secret plan of relishing the essence of the property from its evaporating fragrance. Warm sips had seldom been so welcoming. And just like true love often has a tragic end in literature, two nights later, I was back in the car, braving the serene backdrop of Champakali on the same red mud path till it disappeared behind a curve. I remember not wanting to leave. I remember not having looked back.